I’ve been craving spa-like cuisine this week. We’re finally into spring, yes, but I think it has more to do with indulging a little too much lately with these little pieces of chocolate evil. 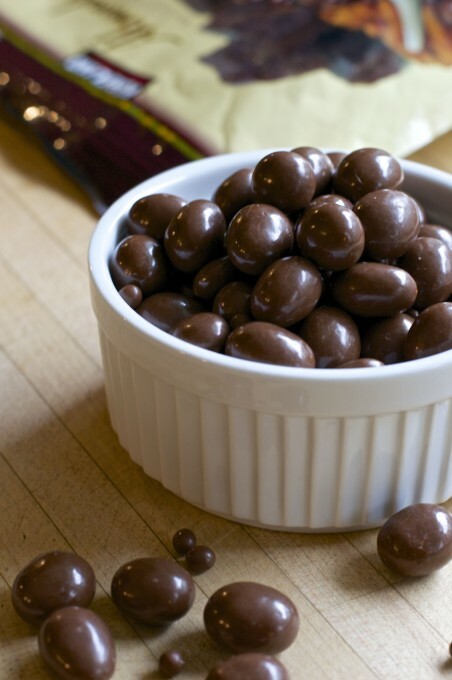 I’m talking about Kirkland’s milk chocolate covered almonds, our preferred after-dinner nibble. Sometimes I think the only reason I pay my Costco membership is to ensure I have a steady supply of these in the house. But enough was enough. Time to take a break from chocolate almonds and focus on healthier eating, at least for a week or two. So my thoughts have turned to salad. 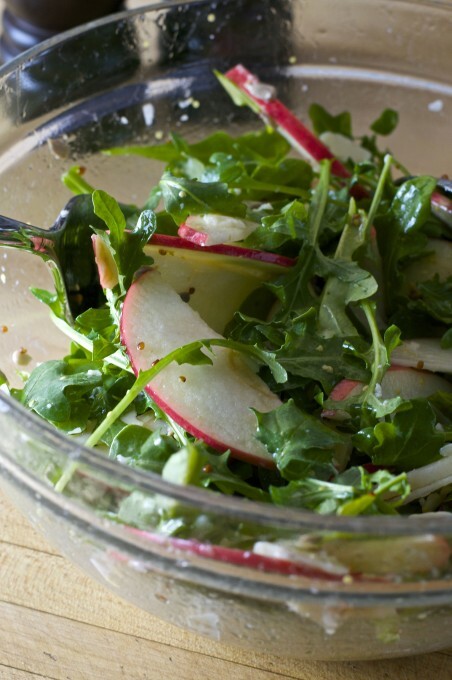 This is a refreshing salad, with crisp apple, tangy sharp cheddar and peppery arugula. Now, my favorite apple — hands down, no question — is the Cripps Pink, or Pink Lady® as it’s also known. 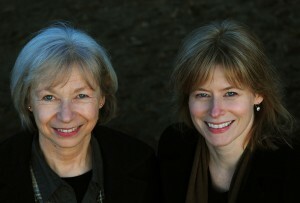 I’m smitten with them, it’s true. This salad is well suited to this time of year, when it’s brightening up but there’s still a chill in the air on the west coast. And it’s super easy and fast to make. Really, there’s no reason to ever buy salad dressing in a bottle. Ever. Me too. Us too, me and Eve. A lovely blend of sharp cheddar, tangy apple and peppery greens that makes a great accompaniment to grilled chicken. Super simple and flavorful -- what more could you want? The inspiration for this recipe is Yotam Ottolenghi's Apple & Cheddar Salad. Just before serving, thinly slice the apple and cheddar. 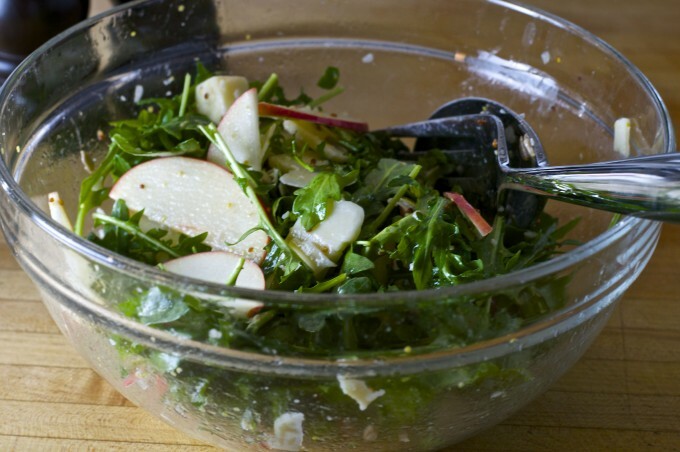 Place the arugula in a medium sized bowl, and toss with 1/2 the dressing. 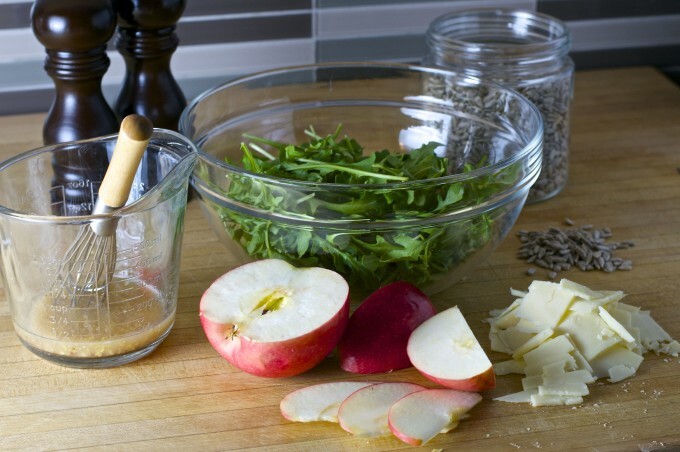 Add the apple, cheddar and arugula and toss until evenly combined. If desired, add more dressing a tablespoon at a time.